Why it matters: PC gaming and mobile gaming are hot. Sales of gaming PCs continue to defy overall PC market stagnation, with annual retail growth rates as high as 31% being reported by research firms like NPD. Some statistics from the new TECHnalysis Research Multi-Device Gaming report show that gamers in the US and China spend an average of 19.5 hours per week gaming on PCs and nearly 18 hours per week gaming on mobile devices. Much of the current PC and mobile gaming usage is occurring on desktop PCs and smartphones. They are the two most commonly owned and most heavily used devices for gaming. For PC gaming, 50% more people said they played games on Windows 10 desktops than Windows 10 notebooks, according to the survey report. The primary reasons for this have been due to power, performance, and cost concerns. To get the kind of compute and graphics horsepower necessary to adequately run AAA gaming titles, you have typically needed a power-hungry desktop PC rig with a discrete graphics card. Yes, there are high-performance gaming laptops, but usually they’re expensive and heavy—until now. As of today, Intel is making a serious push into mobile PC gaming with the launch of an entire new range of 9th generation mobile CPUs specifically targeted to gamer enthusiasts, content creators, and others who demand premium performance. Simultaneously, Nvidia has unveiled a new set of GTX 1600 series mobile GPUs, designed to work hand-in-hand with these 9th-gen Intel CPUs to deliver desktop-quality gaming performance levels at prices starting at $799—much closer to that of desktop gaming systems. While some of these new notebooks are expected to maintain the large, bulky designs of previous gaming laptops, most will look more like the ultrathin notebooks to which we’ve become so accustomed. Leveraging both the improved power efficiency of Intel’s 9th-gen Core processors, as well as the latest iteration of Nvidia’s Max-Q technology, systems will be down to 20mm thickness and weights of just under 4.2 pounds. The laptops that do maintain larger sizes will be able to offer true desktop-class performance, as the high-end Intel i9-9980 and i9-9880 series that are part of this launch are the first notebook parts to offer up to 8 cores/16 threads and Turbo Boost modes up to 5 GHz. Regardless of size or weight, all the new gaming laptops based on these new chips will benefit from a number of other key technology enhancements. On the Intel platform side, all the new 9th-generation Core CPUs offer support for WiFi 6, up to 128 GB of DDR4 memory, and Intel’s Optane memory and Optane SSD, for faster caching, file opening, and app launch times. To leverage the two different flavors of Optane, Intel has created a combination M.2 module called the H10 that houses both an Optane memory chip, as well as an Optane SSD built with Intel’s 3D NAND flash memory technology. The two pieces work together to enable a more optimized path between DRAM and storage. The pairing will provide a more responsive feel when opening files and launching applications in notebooks that incorporate the optional H10. Over time, the performance should actually improve as more applications specifically take advantage of the new system architecture that Optane enables. Nvidia’s new GTX 16 series mobile GPUs leverage the same Turing-based architectural improvements that the recently announced 1600 series desktop CPUs offer—essentially, it’s most everything from the company’s high-end RTX 2000 series except for the dedicated ray-tracing-focused RT cores and Tensor cores. (To be clear, the mobile GTX 1600 parts do support ray tracing—as the desktop parts do—but only via software.) The combination of concurrent execution of integer and floating-point instructions, a unified cache architecture, and adaptive shading techniques from Turing translates to frame rates of over 100 fps on top-level games like Fortnite, Overwatch, and Apex Legends, as well as overall performance improvements of up to 2.5x versus previous GTX 950M-based systems. In addition, the new mobile GPUs support high refresh rate 144 Hz display panels for even higher-quality gaming experiences. According to the TECHnalysis Research gaming survey, Windows 10-based gaming laptops are the 5th most commonly owned and used gaming device among active gamers. However, because they combine the capability and flexibility of gaming desktops with the relative portability of mobile devices, there’s little doubt that number will rise over time, concurrent with the growing interest in mobile gaming. 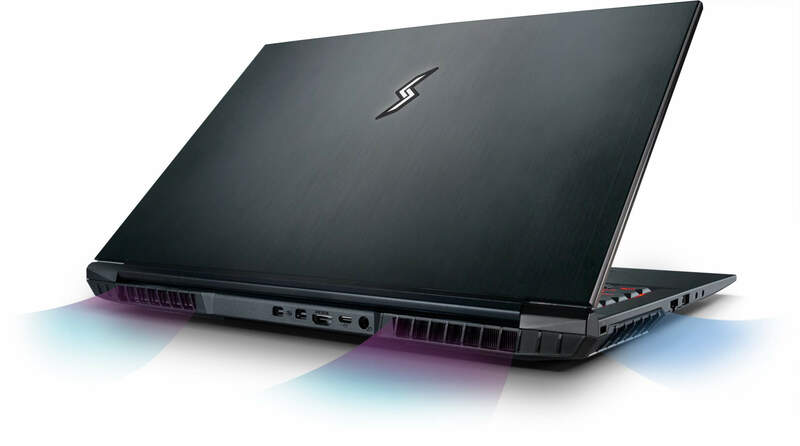 In fact, given recent market momentum, it’s clear that gaming laptops are going to become an increasingly important part of the overall device mix for many gaming enthusiasts, particularly now that more powerful and more portable designs are becoming available at mainstream price points. In brief: Offering up to 10x the performance of integrated graphics, twice the performance of the GTX 950 and up to 1.7x the performance of the GTX 1050, the new GTX 1650 delivers modern features like adaptive shading and a unified cache architecture with larger L1 cache in an affordable package. Nvidia’s Turing architecture has finally trickled down to the entry level with the launch of the GeForce GTX 1650. 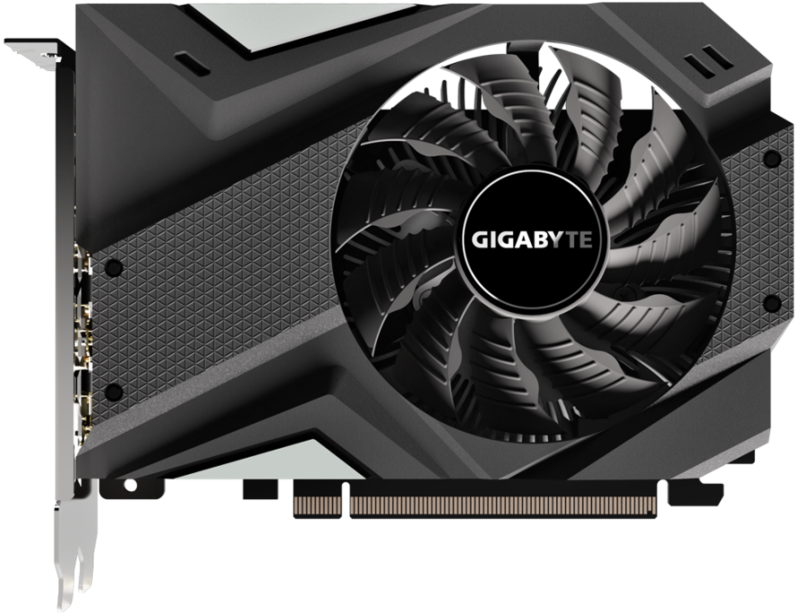 Based on the TU117 Turing GPU, the GeForce GTX 1650 features 896 CUDA cores, a core clock speed of 1,485MHz, a boost clock of 1,665MHz, a 128-bit memory bus and 4GB of VRAM. The GTX 1660, by comparison, has 1,408 CUDA cores, a core clock of 1,530MHz, a boost clock of 1,785MHz, a 192-bit memory bus and 6GB of GDDR5. As referenced in yesterday’s leak, most variants of the GTX 1650 don’t require an external power connector thanks to the relatively low 75W TDP. As such, cards based on the TU117 GPU should be right at home in HTPCs and basic systems tasked with 1080p gaming. Our full review of Nvidia’s latest will be published tomorrow so be sure to check back then for a complete rundown. 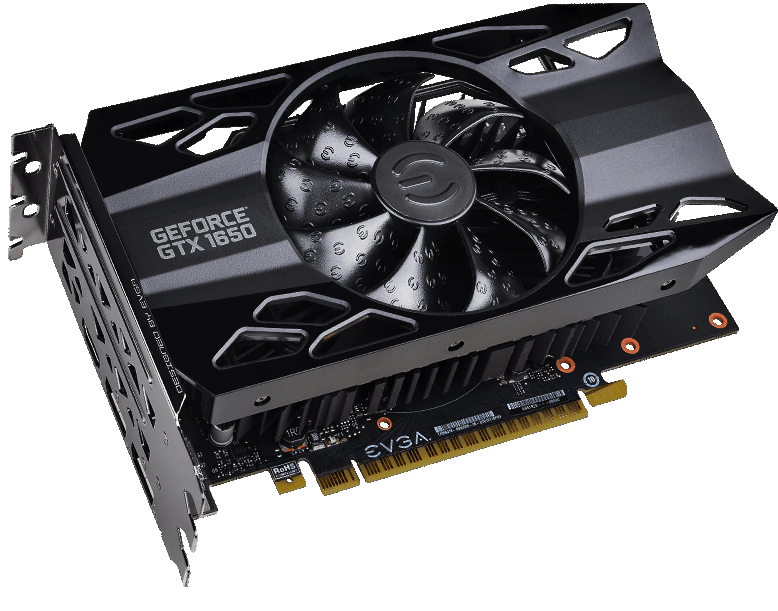 Nvidia’s GeForce GTX 1650 is available from today from select add-in card providers such as Inno3D, Zotac, EVGA, Gigabyte and MSI, among others. Pricing starts at $149 and scales up based on individual feature sets. 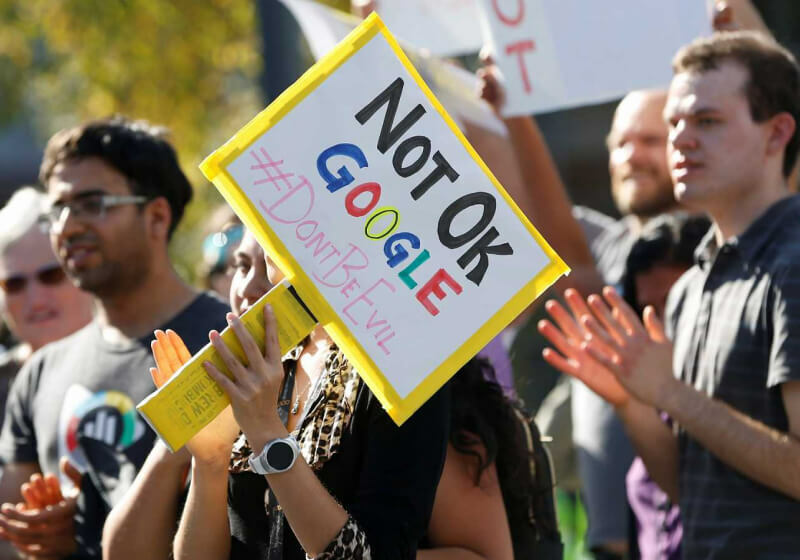 In brief: Two of the Google employees who helped organize last November’s walkout say they have faced retaliation for their role in the protest. Meredith Whittaker and Claire Stapleton were two of the seven Google workers who helped organize the Walkout for Real Change back in November, which saw over 20,000 employees walk out of their offices to protest the way the company addressed sexual harassment allegations against senior executives. The accused were offered golden parachutes: millions of dollars in exit packages. A week after the walkout, Google announced a comprehensive action plan outlining changes to its sexual harassment policies. But Whittaker and Stapleton say both themselves and “several” other organizers have faced retaliation from within the company for their actions. Whittaker, who leads Google’s Open Research, said she was informed that her role would be “changed dramatically” after Google disbanded its external AI ethics council earlier this month. She was told that in order to stay at the company, she would have to “abandon” her work on AI ethics and her role at the AI Now Institute. Stapleton, meanwhile, said that two months after the protest, she was told she would be demoted from her role as marketing manager at YouTube and lose half her reports. She took her complaints to human resources but that made things worse. “My manager started ignoring me, my work was given to other people, and I was told to go on medical leave, even though I’m not sick,” she wrote. Stapleton hired a lawyer and the company reversed her demotion following an investigation, but she says her environment remains hostile and she considers quitting every day. Wired reports that the revelations were posted in a letter on many internal Google mailing lists yesterday, and that the pair are planning a “town hall” meeting on Friday for others to discuss alleged similar instances. The letter claims over 300 employees have faced retaliation since the walkout. Google insists that there has been no retaliation, but Whittaker and Stapleton wrote that these types of actions can be carried out in subtle ways. In brief: T-Mobile is calling out Verizon and AT&T for lack of spectrum diversity in 5G implementation. 5G coverage is expected to be exclusive to urban centers until lower frequency options become available. Verizon and AT&T both claim to have deployed 5G networking in select areas, but T-Mobile is pushing a very different message. The un-carrier is speaking up about the lack of coverage that 5G is likely to provide to rural America in its current state. The digital divide will not be lessened if 5G roll outs continue to rely on high frequency mmWave technology. According to T-Mobile, Verizon’s 5G offering currently is exclusively reliant on mmWave frequencies, preventing it from ever having a chance to “reach rural America.” AT&T is further criticized for continuing to intentionally mislead consumers with its 5Ge branding on what is actually 4G LTE services. One of the major problems associated with mmWave spectrum is the lack of ability to penetrate obstacles. As frequencies continue to grow into the double-digit gigahertz range, longer range cell towers become impractical to implement. 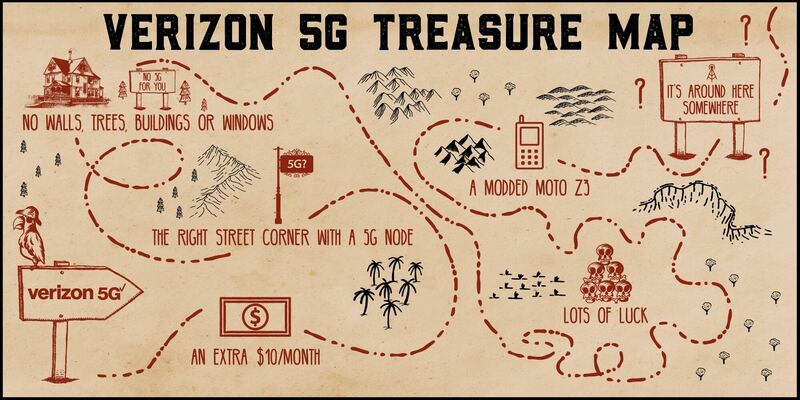 T-Mobile was even kind enough to produce a treasure hunt map for Verizon as an attempt to explain to consumers why 5G is really not ready yet for mainstream adoption. Verizon does not have a 5G coverage map yet, likely because it would be embarrassingly limited, but T-Mobile has pledged to published an accurate coverage map once their 5G services come online. Although T-Mobile has not given a hard deadline for when 5G will be deployed, the Samsung Galaxy S10 5G is supposed to be the first phone on their network to support it. Instead of the mmWave technology that T-Mobile has criticized as being ineffective outside of densely populated urban areas, the company is banking on successfully merging with Sprint. Sharing spectrum licensing with Sprint would give T-Mobile access to the 2.5GHz mid-band that has much wider coverage possibilities. Combining the higher throughput mid-band with existing low-band coverage and selectively implementing mmWave cell sites would allow for more reliable coverage even if speeds are not always drastically higher than current LTE services. The latest initiative to provide 5G for all sounds good in theory, but we will have to wait and see how the final implementation actually turns out. What just happened? Digital Storm has just announced that it has started shipping its next-gen Avon laptop computers equipped with Intel’s 9th generation i7-9750H processors. The new Avons are aimed at gamers, content creators, and other professionals seeking top notch performance on the go. Info on Intel’s newest H-series processors leaked back in February. Digital Storm confirms the i7-9750H is based on the 14nm Coffee Lake architecture. Its six cores and 12 threads boast boosted clock speeds of up to 4.5GHz. So performance is increased over the previous generation while maintaining the same TDP. The Avon features a 17.3-inch 144Hz display in a 15-inch form factor thanks to its narrow 6mm bezel. To drive that display, Digital Storm has equipped the rigs with an 8GB Nvidia RTX 2070 “Max-P,” a higher clocked version of the RTX 2070 for laptops. The new laptops have three USB, one USB-C, one HDMI 2.0, and two Mini Display ports. They will also have an HD webcam and an SD card reader standard. Digital Storm claims the rigs are VR ready. There are two factory-spec models. 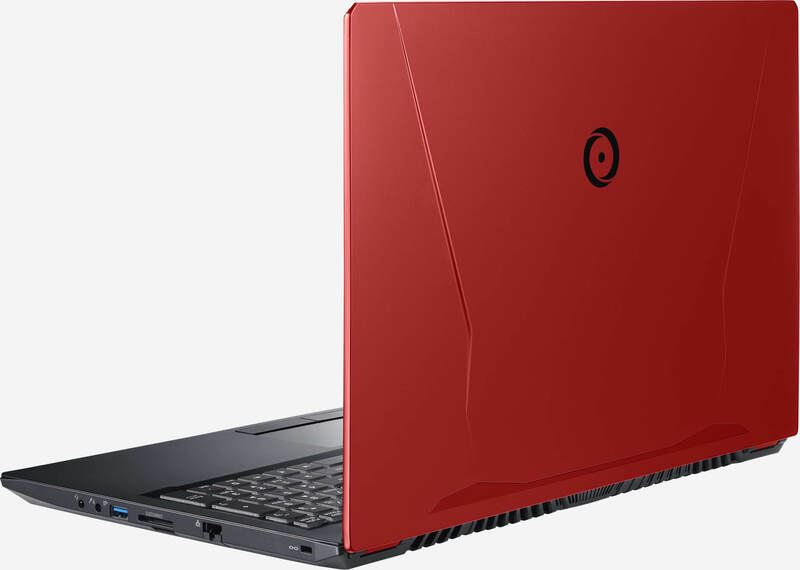 The lower end starts at $1,999 and features 16GB DDR4 2400MHz RAM and a 500GB M.2 NVMe solid state drive. The higher-spec unit ups the RAM to 32GB and the SSD to 1TB and starts at $2,349. Digital Storm’s order page does allow budget-minded customers to configure the RAM down to 8GB and the SDD to 250GB to save up to about $130. There are also several add-ons that some users may want to consider including external optical drives and more. All models carry a 3-year warranty with lifetime support and are available starting today.